Specialist in Periodontics awarded with Master of Dental Surgery from Annamalai University, India & Bachelor of Dental Surgery from Rajiv Gandhi University of Health Sciences & Research Centre, India. 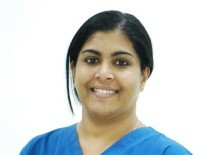 She is also an affiliate fellow of American Academy of Implant Dentistry (AAID Maxi course) USA. She has enormous experience in clinical Dentistry, attended various dental workshops related to periodontics , aesthetic Dentistry & implant dentistry and actively participated in conferences at international level and also presented scientific papers & poster. She has done research on levels of Interlukin-6 (cytokine) in chronic periodontitis patients with Type 2 Diabetes mellitus as her thesis study. Dr Basil has received excellent training in Periodontal plastic surgeries (Gum aesthetic surgeries) , therapeutic flap surgeries and regenerative medicine ( Bone grafts & Membrane). An extensive learner, who likes to upgrade herself in all aspects of dentistry. Registered Dental Practitioner in Kingdom of Bahrain. Member of Karnataka State Dental Council, India.